Nour Ouarzazate Solar Power Complex, the world’s largest concentrated solar power plant will enable Morocco to source almost half the country’s energy from renewables by 2020. The third phase of the project, Noor III, which will be operational as from October 2018, is being constructed near Ouarzazate, in Morocco, with stainless steel provided by Industeel. 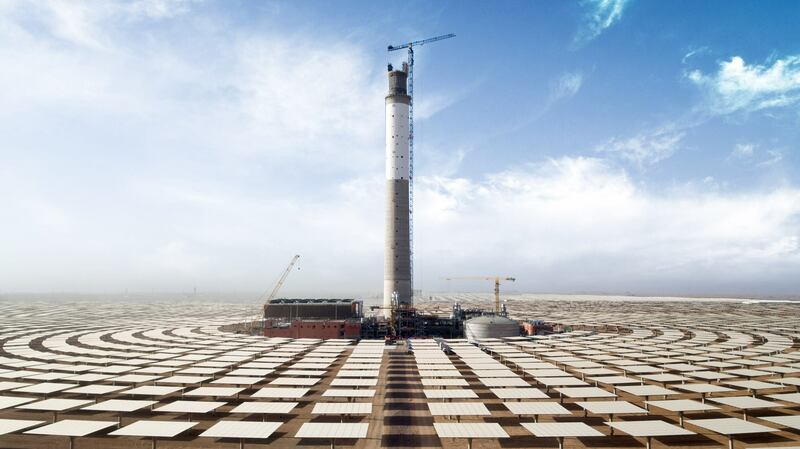 Noor III is the third phase of the Nour Ouarzazate Solar Power Complex. It is developed on an area of 750 hectares and it is expected to supply 500 GWh per year. In an objective of sustainability, the complex could produce enough energy to power more than one million homes and reduce carbon emissions by an estimated 760,000 tonnes per year. Moreover, keeping in mind sustainability, it will use a dry cooling system to decrease water use. Noor III uses a solar power tower topped by a central receiver which heats molten salts to extremely high temperatures reaching around 560°C. Then these heated molten salts are stored up to eight hours, allowing for production of electricity into the night. This technology required the use of our special UR™347H stainless steel grade for the production of the heat exchangers, steam generators, high temperature pipes and molten salt storage tank. Industeel was awarded the prestigious contract thanks to its long-standing relationships with the various equipment manufacturers, among which Prominox, the Moroccan company specialised in stainless steel fabrication who was awarded the construction of the hot molten salts tank. The tank, which has impressive dimensions - 19400m³; 41m diameter; 144m height - will operate at 550°C to store 7 hours of operation of the solar plant.